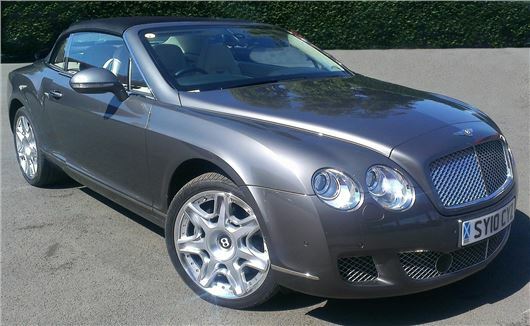 I am looking at second-hand Bentley Continental GT Coupes. One has the 6.0 W12 (E85) engine, Mulliner driving spec, 2 door Auto. The other has the 4.0 V8 engine, also Mulliner driving spec, 2 door Auto. They both have similar specs and the price gap is only £2k difference. The 6-litre is a 2012/12 and has 8,500 miles. The 4-litre is a 2013/62 and has 27,000 miles. They both have 12 months warranty from the Bentley dealer. I appreciate that the 6-litre will be more thirsty, but I will probably only do about 8,000 – 10,000 miles a year as we are retired and will probably also buy a small car for runabout trips. Can you give me some advice re which you think would be the best option and also advice in general regarding this model. You don't need the 6 litre W12 and servicing 12 cylinders is more expensive than 8 so I'd go for the V8. Less weight over the front wheels so better handling, even though they are all four-wheel drive. I had an 2009/59 Audi A6 avant Le Mans A6 Avant and have just changed it for an 2017 Audi A6 avant Allroad. The trouble is I bought four winter tyres and hubs for the first A6. Please can you tell me if these wheels will fit the new car? The Audi garage in Cambridge says No. What do you think? These are two different models of A6. But anyway, AllRoads are fitted with bigger wheels and lower profile tyres than standard A6s to lift them off the ground. These are 235/55 R18; 245/50 R19 and 245/45 ZR20. Your spare set of wheels with winter tyres are probably 225/60 R16. I own a 9-year of BMW M3, purchased new. A few weeks ago, whilst the vehicle was parked, the front offside side deflated. I call the RAC to repair the tyre, only to be told that the tyre was beyond repair as the front spring had broken and ‘speared’ through its sidewall. I eventually found a reasonably local specialist garage who agreed to take on the work and arranged for RAC to collect the car and transport it to the garage, circa 1 week after the puncture was discovered. Amazingly, when the RAC called to collect the vehicle the other front spring had broken also. The reason for the spring failure – based on my engineering judgement – is that the spring design means the maximum stress on the surface of the wire is borderline failure and any corrosion would cause the spring to fail – hence the springs are coated with epoxy paint. On my car the epoxy paint had been eroded away on both springs at the point of failure. Furthermore, should a spring fail, the designed installation should be such that the broken spring could not puncture the tyre. I cannot believe my car is the only one to suffer such a failure and the 2 failures within days of one another reinforces my thinking. Luckily the car was parked when the broken spring puncture the tyre. Others may not be so fortunate. I contacted the board of BMW in Munich and gave them this information – so it is recorded on their system – but they showed zero interest, other than to pass my mail to their UK Customer Services team who stated the obvious by confirming the car was out of warranty. I have retained all broken/damaged parts for analysis. My intention is to ensure that no M3 owners suffer any form of injury due to such a failure. My 2012 Golf DSG has just had the emissions update and I am finding that it seems to change up to 5, 6 and 7 too soon. Having changed up, the engine is labouring. The engine is not running smoothly any more. Is this due to the update or to something else? In answer to a specific question the top engineers at VW told me that the KBA demanded that the power and torque and the revs at which they are achieved should be exactly the same. So should the fuel economy and the CO2 emitted. That's the theory. But the complex fix involves a reprogramming of the injection sequence. There is a trade off between NOx and soot. Less NOx means more soot produced, so the DPF has to actively regenerate more often and uses diesel fuel to do this. To compensate and to keep the overall consumption the same, the injection sequence has been changed. This has worked on the individual used cars submitted to the KBA tests. But every used car is different. If the injectors are a bit worn they don't necessarily cope with this change. If your VW dealer disputes that there is anything wrong with your car caused by the NOx emissions fix you would need to be able to prove that there is. While the remap of the ECU can be checked, the codings can’t. I see that Mercedes-Benz offers several hybrid cars in its C-Class range. I never realised this until reading your site. What is your opinion of them, particularly compared to Toyota hybrids that enjoy an enviable reputation for reliability and customer care, I find some of the idiosyncratic comments made about cars and their merits very much a reflection of particular magazine’s personal likes and dislikes, one aspect of this at the moment, just as an example, is the insistence by car testers, etc to always point out that Lexus still has no diesel. In view of the controversy surrounding diesel, something you've always pointed out, I would have thought it more appropriate to congratulate Lexus. Mercedes did this in two stages. First diesel hybrids, then petrol plug in hybrids. The Petrol Plug-Ins are the ones to go for so, C350e, E350e, S500e. There was a C350e estate parked on the sidewalk just round the corner from me yesterday. The downside is they are all more than £40k, so all subject to £440 a year VED in years 2, 3, 4 and 5. Lexus offers its entire range as petrol hybrids: C200h, IS, GS, RX and LX, but these are not plug-in. A relative has just been told that his four-year old Renault Scenic needs repairs to the ABS costing £1,500. How can this sort of problem develop in a relatively new car? Is it a known problem? Firstly, congratulations on the Newspress award. Well deserved. Good news to brighten the day after just reading Edd is leaving Wheeler Dealers (received 5 weeks ago). Secondly an update on a previous email, I sent to you after my year old Hyundai i10 was nearly a financial write-off following a no fault accident. The whole accident aftermath package was handled by Hyundai Accident Aftercare; I don’t think my broker, the AA was too pleased. My car was undriveable due to inclusive wheel and steering damage and needed trailering to a crash repair specialist: VRG in Bradford 10 miles away. A hire car arrived the next day and three weeks later my car was returned to me in pristine condition. Panel gaps, paint finish, suspension and steering all looking and feeling, as new, which they were because, for example, even though the bonnet had only sustained a slight crease in its abutment with the nearside wing and was otherwise still perfectly aligned, the whole panel was replaced. Cost nearly £5,000. But no airbags activated. I have added the repairers to your Good Garages Guide. All new Hyundai parts were used but I was mostly impressed by the quality of the workmanship. The other party's insurers, local Highways Department, Hire car, Repairers were all handled as part of the package. I did not even have to pay any insurance excess in advance of it being reclaimed from the other party. All in, a calming service after the trauma but is there a Catch 22 somewhere? I was very lucky as I had not bought GAP Insurance this time. Keep up the excellent reviews and advice. I fancy a new Suzuki Swift after reading your review but I already have a car that suits me perfectly. Very pleased to read that Hyundai Accident Aftercare looked after you so well. Accident Management Outfits are much maligned (because they make their money as commission on the hire cars). But in this case they did a brilliant job. I own a Mercedes S350 BlueTech saloon, which, four months ago, due to a squelching sound from the front tyres when turning, necessitated the replacing of the steering mechanism. The car was confined to the Mercedes dealer's workshop for some 14 days in all. Fortunately the repair under warranty. Now, some 160 miles later and having only recently driven a straight and level distance on a Motorway, since the repair, I have found that the steering wheel is misaligned and off set to the right, whereas previously it was square on. My warranty has now expired and I was wondering what degree of responsibility rests with Mercedes for this as I believe that the alignment of the steering wheel is allied to the work they carried out to rectify the overall steering problem. Surely therefore, they are responsible for completing the job. I would be grateful for your comments. Yes, they are. And it is perfectly reasonable for you to return the car to them and politely ask for the steering wheel to be correctly aligned at no cost to you. I have had my 2002 Toyota Celica for a few years and love it to bits but it has loads of scrapes and scratches (not all my fault) and the wheels are a bit of a mess. It has been serviced by Toyota every year, has new tyres, radiator, clutch and goes really well. I am nearly 78 and only do about 5,000 miles a year, but a useful facility it has is that I can get a bike in the back. I was thinking it was not economical to tidy it up, but it is really difficult to find another one for sale. Or will it become a classic one day, do you think? Why did Toyota stop making such a brilliant car. I hate the flat-nosed, Grandma cars - even though I am one. Any suggestions please? If it's scratched and battered it won't increase in value as a modern classic. Only the immaculate cars do that. Best thing you can do is soldier on with it, happy that you don't have to worry too much about additional knocks and scratches. There doesn't seem to be a market for that size and price of coupe any more. The VW Scirocco is a lone survivor and even that is due for the chop soon. A latish Volvo C30 might suit you. Particularly if you can find a rare T5, that was a C30 with the same running gear as a Focus ST. I should warn you that in researching something for another reader, I found out that this model Celica is EU3 and thereby subject to an additional £65 emissions surcharge for entering the London Congestion Zone from October. Don't get caught out by that. I can't find this specific problem, but it may help to switch to using only superdiesel, preferably Shell V-Power Nitro Plus (Or Total Excellium). These fuels have additives that prevent tars and olefins building up in engine fuel systems and that might be what was causing the problem. I'd better also tell you that the twin turbos of this engine get extremely hot, so it is vital to idle the engine for a couple of minutes before switching off, otherwise the turbo oil feed and oil return pipes can get blocked with carbon, restricting the lubrication of the turbo bearings. Given the type of motoring you do and the high ambient temperatures, it's probably a good idea to have these pipes replaced anyway as a precaution. I am leasing a Volvo V40 for a 3-year period from Volvo. (It's a straight lease; no option to purchase). Am I obliged to have the car main dealer serviced, or can I use a local garage using genuine Volvo parts? The terms of the lease in the contract will tell you what you are obliged to do. I don't have the contract so I can't tell you. I’ve been delighted to see several references to the Golf SV on your Saturday pages. If only VW would advertise the same. We have a 1.4 SE TSI 125HP, just on a year old. It’s full of refinement, a dream to drive and returns over 50mpg on most non-urban trips. The extra Climatronic and Winter Pack are well worth the cost and we cannot fault this small MPV. There should be more of them on our roads. I wonder if you can help? I have Peripheral Neuropathy in my feet (not due to diabetes). It reduces feeling in feet and a bit up the legs. My current car is a Hyundai ix20 petrol manual and I like it for easy ingress and egress. I do around 12,000 miles a year. I’m thinking I may need to go auto and perhaps even hand brake and accelerator controls one day. What would be a good auto to get? Who best for accelerator/brake adaptions? I read that you must tell the DVLA about PN, so have just sent it off. Be really please to have your advice. You can get an iz20 automatic, but I think the gentlest auto will be the Honda Jazz 1.3iVTEC CVT-7. Probably the best man to convert it is http://www.jeffgosling.co.uk/ Lots of others in the disabled section in this directory: /useful-websites/specialists/ In my view it is absolutely essential to be able to brake an automatic at any time. Most automatic 'accidents' occur because the driver uses the same right foot for accelerator and brake and loses control. In your case you need a separate hand control for the car's brakes and another for the accelerator. After lots of searching for the right car last August, we upgraded to a 2013 Nissan Qashqai, We loved that it was biggish, looked great and that it was not a 4x4. Having bought it from what we thought was a reputable 2nd hand dealership: Car Giant, we also felt safe in our choice. Unbelievably just over 6 months later we have been told that the gearbox needs replacing at a cost close to £8,000 for a car for which we paid £12,000. Even more incredible is that apparently the law has changed (Consumer Rights Act 2015) and after 6 months Car Giant need not take any responsibility for selling us a car that in my opinion is not fit for purpose, very soon after purchase. We have tried to negotiate with them, but their only statement is that they will 'Stand Against us'. Apparently they are sometimes flexible with time (we are 2 weeks over the 6 months), but in our case our mileage was too high. Mileage at purchase: 35,231 Mileage at point of complaint: 39,877, which means at 4,646 miles we are under the six month average of 6,000 miles. Could it be that because after purchasing the car we found the CD player to be jammed and so they had to replace the whole navigation console where the CD player was? Perhaps they feel they have spent enough on our car? I have also contacted Nissan, but have not heard back as yet. From Googling car chat rooms such as Qashqai club, I have found out that there appear to be others in a similar situation with gearboxes that are knackered after 3-4 years. As I am not familiar with much to do with cars I have no idea if that is common. I use this car to earn a living and at this point in time we do not have the money for repairs. Please can you help us? I wonder if you can help me? I bought a 2013 AMG SLK in August 2016 and it came with a 12 month Mercedes used car warranty. Over the last few weeks the drivers door cant be opened from the inside, so I have to take the window down and open from the outside to get out of the car. I am taking it into the garage for inspection on Friday, however, they want to charge me £114 for a 'diagnostic'. Is this something that I should accept? After all I have only had the car just over 6 months? The car’s service history shows that it has been serviced and MoTd by the main dealer throughout. Also, do you think I should be charged for any spare parts that the dealer decides need to be replaced? Any advice would be appreciated. Over the past few months my wife’s 2007 Corsa 1.4 automatic engine has ‘hunted’ spasmodically at around 2,000 to 2,500 revs, engine note rising and falling, but not significant variation in speed or revs, more sound of engine note. It doesn’t try to change gear. We have taken it to the Vauxhall dealer, nothing found on diagnostics or road test (if they did one), It has done around 70,000 miles, had all its services, we are told. Could it be auto fluid needing a change; should there have been one and in the absence of a book, how do we know what is required or done? Have you any other instances of this? The problem might be caused by nothing more than a dirty mass airflow sensor. Probably worth having the transmission fluid changed, which has to be done by a dialysis process so is a specialist job: http://www.fedauto.co.uk/ Have you had the timing belt, tensioner, waterpump and aux belt changed? If not, that is overdue. My wife is thinking of buying a FIAT 500,1.2 Lounge start/stop manual. It’s a 2 owner, October 2014/64 with 14,144 miles on the clock. It looks in very good condition, we’ve yet to drive it. It’s at a local garage. Is there anything we should look out for or any no-no’s? They’re asking £6,282 for it. Any advice would be welcome. I drive a 2006 Mazda MX-5 2.0 litre Sport, now with 38,000 miles, that, for the past 4 months has a fault that makes it hesitate (on and off), in 6th gear when driving at a constant speed. The rev counter remains steady, even when the fault is present and there is no shudder: just a slight hesitation lasting for no more than 1-2 seconds. On rare occasions, the car behaves perfectly in 6th gear and the fault does not appear to be evident in 5th gear. The fault is there when driving at any constant speed between 40mph and 80mph. I have had it in with the Mazda dealership 3 times. The first time they could find no fault; second time, the fault showed up and they suggested changing from supermarket petrol to BP Ultimate and they also changed the plugs, but still no cure. They also downloaded an update for the ECU, but to no avail. Third time they still had no answers even when they drove it with the diagnostics computer plugged in. I have also taken it to another independent garage which left them scratching their heads what to do to resolve the problem. I would be most appreciative of any suggestions that you might have to solve the problem. I would have suggested (as the garage did) a switch to Shell V-Power actually because it's higher RON than BP Ultimate. But the other possibility is a very small fault with the mass airflow sensor, so small it isn't triggering a fault code. Another reader had a similar fault with an Audi R8 that cut power in 3rd gear when driving between 30mph and 40mph. It turned out to have been programmed by Audi to do this in order to pass the EC Drive-By Noise Test, and the reader was able to demonstrate by a graphic display on a tablet computer plugged into the OBDII port that between 30mph and 35mph the engine throttle did not respond to the accelerator pedal. However, we later discovered that the fault was due to an errant ABS wheel sensor. I took my Citroen Grand Picasso, which had covered 42,000 miles, to my local Citroen dealer in the week before its 3-year warranty was due to expire. They duly found a fault with the front shock absorbers and quoted me a price of over £400 to replace them. They explained that the shock absorbers are only covered by a 40,000-mile warranty, as opposed to the 60,000 mile warranty that is widely advertised by Citroen. On the Citroen website there is a reference to the drivetrain having only a 40,000 mile warranty, but everything else 60,000. I rang Citroen UK and they maintained that certain exclusions do apply, shock absorbers being one of them, despite their own website making no mention of this. Please can you advise me where I stand legally. I am appalled that Citroen should attempt to try and hide behind an unpublicised loophole in this way. If I was to pursue this matter through a court of law, would I have a case? Read the terms and conditions of the warranty very carefully to see if there are any weasel words in there indicating either that that dampers are not covered or that unspecified components are not covered. A damper is not drivetrain. It is suspension. I guess the reason for the short warranty on dampers is the potential for wrecking them on speed humps, but if nothing tells you they are excluded then you could insist that they are replaced FoC on the grounds you would not have bought the car in the first place had you known they had a shorter warranty than the rest of it. My niece (soon to be aged 60) is hoping to pass her driving test shortly. I've said I'll give her £5k towards a car as long as she passes the test and she puts some cash in too (I'd estimate between £1k-£2k - so £6-7k altogether). The car would have to be automatic as that will be the licence she's going for. Her mother (my sister) has a Yaris hybrid and she'd like one of those but realises it will be out of her price range. So she thinks she'd like a Yaris auto. I'd encouraged her to think of a Mazda 2 auto (the model previous to the current model). My advice to her is to look for a Japanese or South Korean car rather than a European car. What would you recommend she looks at given her limited budget?